Even if you don’t care about that stuff, they’re still really tasty. But, that flavor comes at a cost: bananas have lot of sugar in them. In fact, a cavendish banana has about 47 grams of sugar in it. To put that into perspective, a mars bar clocks in at less than 37 grams of sugar! To be fair, bananas have a lot more nutrients than mars bars and a lot less fat t0o. Bananas have about 6 grams of fiber, 4.7 grams of protein and of course they’re known for their potassium, although they only have about 1 gram of it. The World’s Healthiest Foods website lists bananas as the 29th food with the most potassium per serving — Swiss Chard, Lima Beans and Potatoes are the top three. Bananas are also a very good source of vitamin B6. About 4000 years ago, Whiskey (or Whisky) was invented to purify perfumes and aromatics. Now, some Whiskey is aged longer than many people were back then. Soft drinks are a much more recent invention, although perhaps still older than you may think. Soda water was first introduced to the world by Joseph Priestley in 1767 when he published his paper, Impregnating Water with Fixed Air. Yes, that’s the real name of the paper. Ladies probably don’t know this, but the urinals in men’s bathrooms, usually at bars or clubs, sometimes have ice in them. Even though many men have seen this, they don’t usually know why it’s there. The Kuna Indians of the Panama Islands consume large quantities of cocoa, even when compared to those living on mainland Panama. Potassium-40 is a fairly unstable isotope, although the half life is nearly a billion years. Because bananas have so much of this isotope, there is enough decay to generate one positron (approximately) every 75 minutes. A positron is basically the opposite of an electron. It has the same mass as an electron, but a positive charge instead of a negative one. It is the electron’s antimatter doppelgänger. 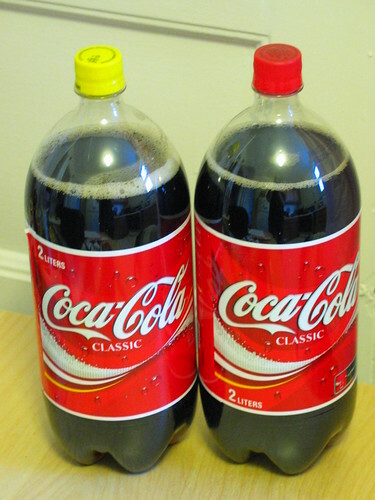 In many countries, Coca-Cola and most other soft drinks, are sweetened with High Fructose Corn Syrup (HFCS). This is not real sugar from cane or beets, it is a processed sweetener made from corn that is almost identical to natural sugar. There have been some debates and studies about whether or not HFCS is bad for us. Without getting into it, I will say that some people don’t have a problem eating HFCS and other people do. The reasons for avoiding HFCS vary widely and one of them has led to Kosher Coke. Because high fructose corn syrup is made from corn (a grain) it cannot be consumed by (Orthodox) Ashkenazi Jews who refrain from eating grains during passover. Vanilla is often associated with plain, boring and ordinary; however, vanilla is anything but vanilla. Now, it’s hardly the kind of thing you’d find shady characters dealing on a dark street corner. In fact, it’s not the kind of thing you’d likely find anywhere — I mean, good luck finding Grade A Tahitian Vanilla Beans in most cities. If you do find them, you’re looking at $5 or more for a single bean.